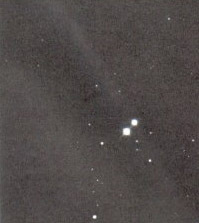 61 Cygni was christened the "Flying Star" in 1792 by Giuseppe Piazzi (1746-1826) for its unusually large proper motion. Its apparent position would shift by an amount equal to the width of the full moon in only 150 years. 61 Cygni-A is an orange-red main-sequence dwarf star of spectral type K3.5-5.0Ve. It has about 70 percent of a solar mass, 72 percent of its diameter and about 8.5 percent of its luminosity. It appears to have about 79 percent of the Sun's metallicity. It appears to be a variable star. It orbits 61 Cygni-B with a highly elliptical orbit (e=0.40) that gives distance extremes 51.7 and 121.0 AUs in an orbit of period about 722 years. 61 Cygni B is and orange-red main sequence dwarf of spectral type K4.7-7.0 Ve. It has about 63 percent of of a solar mass, 67 percent of its diameter, and 3.9 percent of its luminosity. 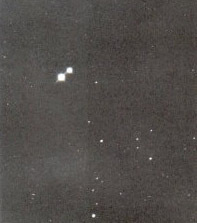 This binary system is designated Struve 2398 and are probably dim red dwarf stars similar to Gliese 623A and B shown in the NASA HST image at left. This system is located about 11.4 light-years (ly) away from our Sun, Sol. It lies in the northeastern part (18:42:46.69+59:37:49.42, ICRS 2000.0) in Constellation Draco, the Dragon -- northeast of Grumium (Xi Draconis) and southwest of Altais or Nodus Secundus (Delta Draconis). Struve 2398 is too dim to be seen with the naked eye.